Dr. Joseph Carcillo, who is one of shoe shiner Albert Lexie’s customers. Lexie shines shoes at the Children’s Hospital of Pittsburgh. Mr. Lexie doesn’t keep his tips. 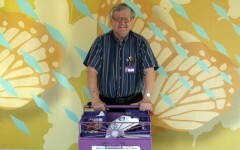 Every tip he has ever received since he began shining shoes in 1981 has gone to the Children’s Hospital Free Care Fund. The fund goes toward the care of sick children whose parents cannot afford to pay for medical care. Over the years, his hard-earned tips have amounted to more than $200,000 for the free-care fund.